This AP Biology Lab requires students to set up respirometers to measure the oxygen consumption of germinating peas in cold and warm water. Students can complete the lab in two days – 1 day for setup and data collection and the second day for a discussion and analysis of the data. 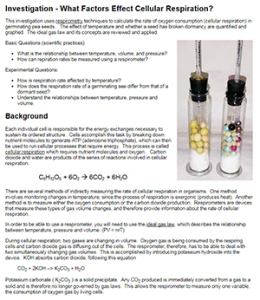 Lab guide also includes a discussion of cellular respiration, though it is not necessary that students have a complete understanding, the lab can serve as an exploration of the topic. Students can even devise ways to test respiration rates of animals that can fit into the respirometer to add an “inquiry” element to the investigation. I have used mealworms with success, though the chamber needs slight modifications and you can only estimate volume by using the same number and size of worms. Most of the equipment can be reused year after year. I have permanently affixed the pipets to the rubber stoppers and sealed with gorilla glue, which eliminates one major problem with the lab where the pipets leak. Test tubes can be substituted for glass vials, though you might need to reduce the overall volumes. Potassium hydroxide can probably be found in the chemistry department, though you don’t need very much of it, it is essential for this lab to work properly.